Sixteen successful ‘Fast Track’ projects are receiving a share of £6 million Coastal Communities Fund money to help deliver sustainable growth and jobs across the Great British Coast. As part of the fifth round of the Coastal Communities Fund, 16 ‘ready to go’ projects have been selected to start work to transform their coastal communities in 2018 to 2019 before the main round funding becomes available in April 2019. The chosen projects, which range from a community arts project in South Shields to heritage boat tours in Falmouth’s historic docks, are collectively forecast to create over 1100 jobs and are set to attract public and private sector co-funding of £2.4 million. "It’s really exciting to see money from the Coastal Communities Fund help kick start these shovel ready projects, which have the potential to unlock the barriers to development and growth in our coastal communities. "Investment in our seaside areas, through projects such as these, will provide nothing short of a New Deal for the Great British coast, creating thousands of jobs, training places and opportunities along the shore." 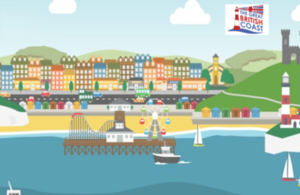 The Coastal Communities Fund was established to support coastal projects in the UK deliver sustainable growth and jobs. Applications submitted for Round 5 of the Coast Communities Fund are currently being assessed. The successful main round bids of the remaining £34 million are expected to be announced by early 2019. A £53,000 grant towards a £70,000 project to employ a village commercial manager to develop and organise events and to provide facilities to attract more long-stay visitors and extend the visitor season. Project includes implementing a 3-year promotion, marketing and development plan for the village. £304,000 grant towards the £324,000 Berwick “Welcome Visitor” project to improve the town’s visitor offer by promoting new visitor opportunities, events and products that will encourage longer stays and extend the current visitor season. £53,000 grant towards a £177,850 project to diversify coastal and maritime tourism in Devon. Funding will support the development and promotion of a package of measures to increase cross Channel leisure yacht visits between Brittany and Devon, both during and outside the peak season. £61,390 grant towards a £76,425 project to refurbish an industrial landmark building - St Hilda’s Pit Head in South Shields - and transform it into a community, cultural and heritage hub providing training, office, event and exhibition space and a base for a community arts project. £170,000 grant towards a £340,000 project to position coastal West Sussex as an active hub for water-based sports. Funding will promote collaboration and an experience based marketing campaign for local businesses, including a water sports development office. £98,077 grant towards a 106,000 project to create a new tourism offer aimed at families and occasional cyclists to make Deal a cycle friendly town. Funding will support the development of family friendly cycle routes, improved signage and the creation of new cycle maps and guides, plus a new e-bike share scheme. £985,522 grant to improve the tourism offer and visitor experience for people with disabilities visiting the Fylde, Blackpool and Wyre coasts. Project includes training courses for local businesses to support people with disabilities, organising new events and the creation of trained volunteer access guides. £258,526 grant to create a joined-up network of volunteers and businesses along the Jurassic Coast, in partnership with local education providers. It will include an IT platform with training, accreditation, recruitment and business relationships managed by the Jurassic Coast Trust. £803,236 grant towards a £1.295 million project to develop a centre of excellence to provide training and development for a new generation of leaders and workers in the cultural and tourism sectors. It will also support 2 festivals of contemporary culture and the use of new technology to create new coastal digital experiences to attract visitors throughout the year. £71,000 grant towards a £985,000 project to increase nature tourism by working with local businesses to enhance engagement in the nature tourism offer of the Lancashire coast. Events, talks, surveys and workshops will be organised to encourage local communities to champion the coast. £110,000 grant towards a £223,200 project to introduce heritage boat tours of Falmouth’s historic docks, with trained tour guides, to highlight maritime history and wildlife. Funding will increase visitor numbers, create jobs and volunteering opportunities and support local maritime businesses. £60,000 grant towards a £119,900 project to support the creation of an Isle of Wight Events Centre. The aim is to enhance the estuary’s tourism offer with local hospitality providers and businesses and encourage more collaborative working and marketing. £896,568 grant to the Scarborough Construction Skills Village project to help tackle local unemployment and skills challenges. Funding will support local residents into new apprenticeships and jobs in the construction industry, particularly in micro and small construction companies. A £1,093,520 contribution towards a £1.29 million project to transform the St Austell area as a visitor destination. Funding will support a programme of public realm, cultural initiatives and events and skills training to attract more visitors and extend the tourist season. Ac £414,763 grant towards a £1.44 million project to bring to life ‘The Hold’ - a new Suffolk Archives and Heritage Centre next to the Ipswich Waterfront. Funding will deliver a comprehensive, year round heritage activity and events programme to develop new audiences to visit Ipswich Waterfront. £499,100 grant to support the local creative economy in Margate’s High Street and town centre by kick-starting Margate’s first Fabrication Laboratory. This will provide technical skills training, business planning and design mentoring/ facilitation for local creative businesses and professionals.